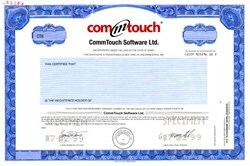 Beautifully engraved specimen certificate from the CommTouch Software, Ltd. printed in 1999. This historic document was printed by the American Banknote Company and has an ornate border around it with a vignette of the company's logo. This item has the printed signatures of the Company’s Chief Executive Officer, and Chief Financial Officer, and is over 17 years old. Commtouch® (NASDAQ: CTCH) provides proven Internet security technology to more than 150 security companies and service providers including 1&1, Check Point, F-Secure, Google, Microsoft, Panda Security, Rackspace, US Internet, WatchGuard and Webroot,, for integration into their solutions. Commtouch’s GlobalView™ and patented Recurrent Pattern Detection™ (RPD™) technologies are founded on a unique cloud-based approach, and protect effectively in all languages and formats. Commtouch’s Command Antivirus utilizes a multi-layered approach to provide award winning malware detection and industry-leading performance. Commtouch technology automatically analyzes billions of Internet transactions in real-time in its global data centers to identify new threats as they are initiated, enabling our partners to protect end-users from spam and malware, and ensure safe, compliant browsing. The company’s expertise in building efficient, massive-scale security services has resulted in mitigating Internet threats for thousands of organizations and hundreds of millions of users in 190 countries. The key Commtouch services - Anti-Spam, Zero-Hour™ Virus Outbreak Protection, GlobalView™ Mail Reputation Services, GlobalView™ URL Filtering, and Command Antivirus® – all provide information for each other in a comprehensive, self-learning feedback loop that learns locally as well as globally. Relying on Commtouch enables licensing partners to focus on their own areas of expertise, secure in the knowledge that Commtouch is always well ahead of the latest Internet threats. Commtouch was founded in 1991, is headquartered in Netanya, Israel, and has a subsidiary with offices in Sunnyvale, Calif and Palm Beach Gardens, Florida.